Christmas Plants and how to care for them. Christmas is a wonderful time of year and I’m sure that as your company comes to visit, they may also bring you a gift of flowers or plants. Plants make a beautiful hostess gift and they are certainly a seasonal gift. But once you have it, what do you do next? Well let me help you just a wee bit. First off, you want to take it out of any wrappings of cellophane, get a nice dish to put under the plant, we don’t want you damaging the furniture with water rings. Then place it in a room where it well get a fair amount of light, but away from the front door where it will certainly get a draft each time it’s opened. 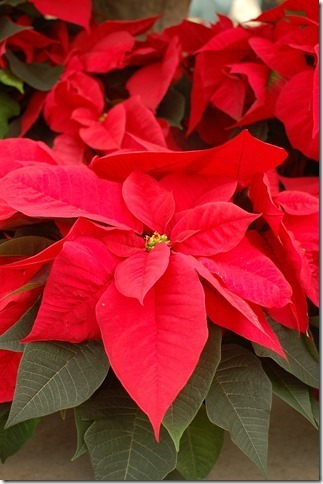 Now if we are talking a Poinsettia plant, they are really easy to care for and don’t require a degree in Horticulture to keep them growing over the holiday season. Water them once a week, do not leave them sitting in water, rather water well and then remove any standing water in the catch saucer underneath. You can let them dry out a little bit between waterings, but don’t leave them too long without water or the will start to drop their leaves. Feel the soil with your fingers and if it feels just a little dry, water a bit. If you do this, I’m sure that you will have your poinsettia till April or May and then you will either be tired of it and relegate it to the compost heap, or take it outside and let it continue growing. The choice will be yours. There are other Christmas plants that may arrive at your door as well. Some of the most popular are Christmas cactus, Cyclamen, Mixed Plants, Topiaries of Rosemary or Ivys or you may receive some Paperwhites or Amaryllis. The beauty of plants is that they want to grow, they have been picked for their beauty and versatility. The greenhouses do a great job in giving you information to keep the plants growing for at least the Christmas season. If you are really not a plant lover, the worst that will happen is that they will die after a few weeks. For some people this is quite alright, others will do whatever they can to keep these plants tended till spring arrives and then go to town finding the perfect spot in the garden so that they can continue to grow. Learn more about gardens and gardening from me. I love to garden both indoors and out. There is much more information available at Grammie Knows How – join me there and we will have some fun growing wonderful plants all year long.